Every once in awhile I wish I were a cartoonist. I only lack two things: sustained drawing talent and rapier wit. Tragically, I have just enough drawing skill and just enough longing for a sense of humor to pick up a pencil now and then to give it a go. I loved comic books as a kid: mostly Archie and Superman. I didn’t have the means to buy many. (When I had a quarter, I usually chose to get a 5-scoop of Swiss chocolate at the Velvet Freeze.) And when I did get my hands on a comic book, the reading went way too fast. It got my senses all a-goggle, then it was over. I desperately wanted to draw my own but didn’t have a clue how to approach it. Occasionally, I would laboriously copy a panel or two and wind up overwhelmed by the difficulty of it. Like I said, I’m not completely devoid of drawing aptitude. I can copy pretty accurately (though the final result is always a little “off”). At the age of 12, my friend Frances and I could while away a summer afternoon drawing pictures of women and filling the margins of the paper with their melodramatic life stories. But our figures were wooden, just standing there, with mitten hands and club feet, as we focused on their hairdos and the costumes. But to depict the same women in action, at the various angles required by a comic strip… fugeddaboudit. There was a time, however, when I did actually get paid for my cartoon figures. 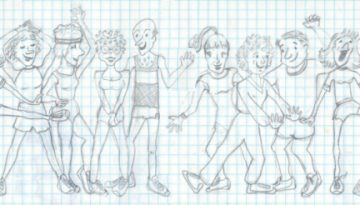 A friend who ran aerobic dance classes in the eighties was enthusiastic about everything I did and relied on me for her advertising and handouts. Pat always assumed that if I didn’t know how to do something, I’d figure it out... fast. I was basically a calligrapher but began throwing in some dancing stick figures, which she adored, and wanted me to illustrate all her routines. Those were labor-intensive days. From photographs of her demonstrating the choreography, I learned how to draw muscular little silhouettes in just about any pose imaginable and labored fondly (at 25 bucks an hour) over the curvy transitions of shoulder to bicep and buttock to thigh to bulging calf – piking, kicking, lunging, stretching, and generally boogying to hits of the eighties. Sometimes I turned my little androids into people. I carried around a book called Cartooning the Head & Figure by Jack Hamm, which was an encyclopedia of inspiration, with pages of cartoon noses, eyes, hair, hats, mouths, and, best of all, a cross-indexed catalog of faces expressing a lifetime of emotions. By the end of the eighties aerobic dance was dead, Pat had moved out of town and I was on to other things. But last year, probably on another one of these long, reflective weekends, the bug hit me again. Got some more How-To’s and delved into the history of “dangerous drawings.” Did a few desultory sketches but found myself more absorbed with taming bitmaps in Photo-Paint. Here I am again. Fretting over my lack of capacity. Got another book: Understanding Comics: The Invisible Art by Scott McCloud. He deconstructs the world of comics and systematically illustrates how we respond to them and why we love them. For me, I think it’s the rhythm and symmetry of the small panels lining up on a page, the orderliness of the flow, but with a surprise in every box – and the occasional breaking out of the box. It appeals to the organized school-girl in me as well as to the rebel in me. Your feedback is welcome! Contact me.